Maybe you have spotted the telltale signs of an infestation of pesky wood eaters in your Scottsdale business or home. Maybe one of our experts has completed a free North Scottsdale termite inspection and discovered feeding activity in your building. Regardless of how you have found out that there are termite present, now is the time to do something about it. Upon discovering that there are pests in your North Scottsdale building structure, acting fast and working with a professional exterminator is your best bet of controlling the situation fast and efficiently. Varsity Termite and Pest Control has assisted clients for decades in the safe and affordable removal of pests such as termites. Your best bet in ridding your home of bugs and pests is to work with an experienced exterminator such as Varsity. All of our pest control technicians have years of training and field experience and are licensed to provide termite control services in Arizona. We can easily identify points of entry and eradicate the problem effectively. Spraying or controlling termites is not a DIY job, but should be left to a professional North Scottsdale pest removal expert. Varsity not only has the experience but also the equipment that is necessary to combat those pesky little critters. What kind of equipment do we use? Items such as masonry drills, soil treatment rods and pumps, for example. Remember: the sooner you act, the better are the odds of us removing “your” colony completely and with fewer treatments. When it comes to North Scottsdale termite infestations, time really is money as every second that you don’t act, termites keep feeding on your home and eat it up from the inside out. Because we understand how annoying and expensive a bug infestation can be, we offer a free home inspection if you suspect that you may have a problem. When it comes to termites being proactive is essential. The longer you wait to do something about it, the bigger the damage will be. A swarm consists of millions of wood eating bugs that can do some serious damage to your home and furniture, because they feed on the cellulose and never take a break. No wonder they are responsible for millions of home damages all over the U.S. Hiring a professional pest control expert means that you can be certain that the colony is eliminated properly. Working with spray and pesticides can be potentially harmful to humans and you need the right gear and maybe even protective equipment to guarantee safety for all parties involved (except the termites). One popular and exceptionally effective method is the use of the Sentricon Termite Colony Elimination System which takes advantage of the habits and biological behavoir of suberterranean termites to help eradicate them from your property. Contact Our North Scottsdale Termite Pest Control Company Today! Varsity Termite and Pest Control has years of experience in assisting home and business owners in getting rid of termites, scorpions, roof rats, and other pesky bugs. We are so sure that our pest control services are the best in North Scottsdale and nearby communities that we back them with our exceptional 100% warranty. Contact the pest control team at Varsity today to get your free home inspection scheduled. At Varsity Termite & Pest Control, we understand that there is no “cure-all” treatment for termites, and each one warrants a different method of treatment that we are qualified to implement to solve your most severe termite problems. We have years of experience treating homes for both drywood and subterranean termites in North Scottsdale, giving each client the quality results and piece of mind they deserve. Trust our North Scottsdale termite technicians to eradicate these destructive pests from your home. For a qualified termite control company in the North Scottsdale area of 85266, enlist the help of Varsity Termite & Pest Control. We have the best track record and the highest quality termite treatment and control in the North Scottsdale area. Varsity Termite & Pest Control has five star reviews across the web for a reason. We are both affordable and effective in our termite services, providing the very best in termite removal and control. Trust us to to rid your home of termites. For a termite control company in the North Scottsdale area of 85259 with a proven track record for termite removal and treatment, contact Varsity Termite & Pest Control. We can provide you with comprehensive and effective termite treatment. Varsity Termite & Pest Control is a top rated North Scottsdale termite control company with five star reviews on Yelp. Our client satisfaction is next to none, and we pride ourselves in our ability to provide fast, comprehensive, and affordable termite removal and treatment to residents and businesses throughout North Scottsdale. For more information about our extensive termite removal services, or to schedule a free termite inspection, contact Varsity Termite & Pest Control for all of your termite removal needs. At Varsity Termite & Pest Control, we provide the most effective termite control and treatment for residents and business owners throughout the North Scottsdale Area. We can also give you some tips to help prevent any future termite infestations. With our wealth of knowledge on termite habits and populations, you can keep termites from settling in your home for years to come. Avoid stacking firewood or lumber against your home. We suggest that you rather use a storage box or shed and keep the wood off the ground. Make sure to inspect firewood carefully for signs of termites or other pests such as scorpions and spiders, prior to bringing it indoors. As termites are attracted to water, it is important to divert water away from the house by using appropriate downspouts and gutters. This will reduce water pooling in areas. Eliminating other sources of water around the foundation of your home such as backed up drains or leaking garden hoses will make termite control much easier. Reduce and prevent humidity by ensuring proper ventilation in crawl spaces. For termite exterminators near you in the 85255 area of North Scottsdale, contact the professional termite control experts at Varsity Termite & Pest Control. At Varsity Termite & Pest Control, we provide free termite inspections near you so that you know exactly how extensive your termite infestation is before determining a course of action. Get local termite control in the North Scottsdale area of 85260 when you enlist the help of Varsity Termite & Pest Control to take care of your termite infestation. The first step for North Scottsdale termite control is to track down and identify the infestation and how extensive it is. There may not be clear evidence of it right away, but this is a very important step. Look for wood damage in crawl spaces and basements, and especially your attic and where there is a lot of exposed wood. Before you call your local North Scottsdale termite exterminator, you can try introducing beneficial nematodes to your soil. Nematodes are a type of worm that are parasitic and target most pests. Nematodes can be purchased online or at some garden stores. Implement all of the above bullet points to effectively check for the presence of termites. If you have discovered termites in your home, it is time to call a professional to get them taken care of and make sure they do not cause any further harm. The professionals at Varsity Termite & Pest Control know how to properly implement industry techniques to help drive the termites out. Contact your North Scottsdale termite control company to get a fast solution today! For exterminators in the 85050 area of North Scottsdale, contact the professionals at Varsity Termite & Pest Control to ensure that your home is no longer harmed by these destructive pests. Varsity Termite & Pest Control provides termite control services nearby for an affordable price that won’t break your budget. Get the solution you need today to ensure that your home remains secure. Get the best termite services near you with the quality, professional termite removal team at Varsity Termite & Pest Control. We can give you peace of mind knowing your home will be termite free. 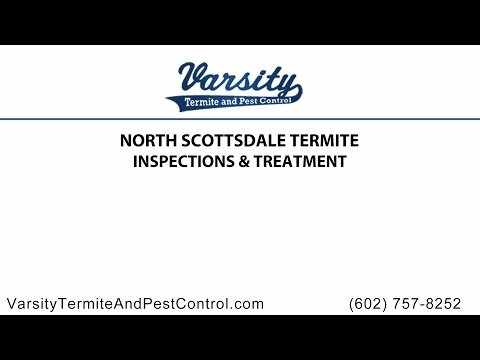 Contact Varsity Termite and Pest Control today to learn more about our North Scottsdale termite control services and to schedule your free Scottsdale termite home inspection.